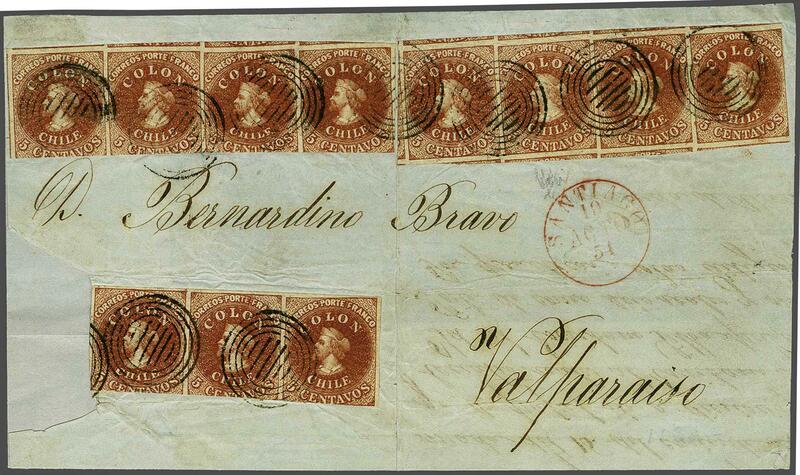 Lithographed by Henri Gillet 1854 (April-August): 5 c. very deep red-brown, a horizontal strip of three and two horizontal strips of four, formerly an irregular block of eleven stamps, margins shaved to huge all round, used on large part 1854 cover to Valparaiso and tied by six barred target handstamps in black. SANTIAGO despatch cds in red (Aug 19). One stamp has unfortunately been removed / lost, however a remarkable 3 ounce rate cover: the stamps in a resonant deep shade and showing Lithographic Transfer varieties on third stamp from left with squeezed CHILE reading CHILF (Blank 5/Vt 2/7), and first stamp in the strip of three with squeezed CHILE flaw (Blank 5/Vt. 2/8). Illustrated in 'Chile First Issues of Postage Stamps 1853-1867' by Gerhard Blank on colour plate 13. A remarkable item that displays well.rnProvenance: Collection Joaquin Galvez, Corinphila sale 62, May 1979, lot 3358; Collection Gerhard Blank, RL, Dec 1991, lot 1070.